I am glad to have found the R package GGally. 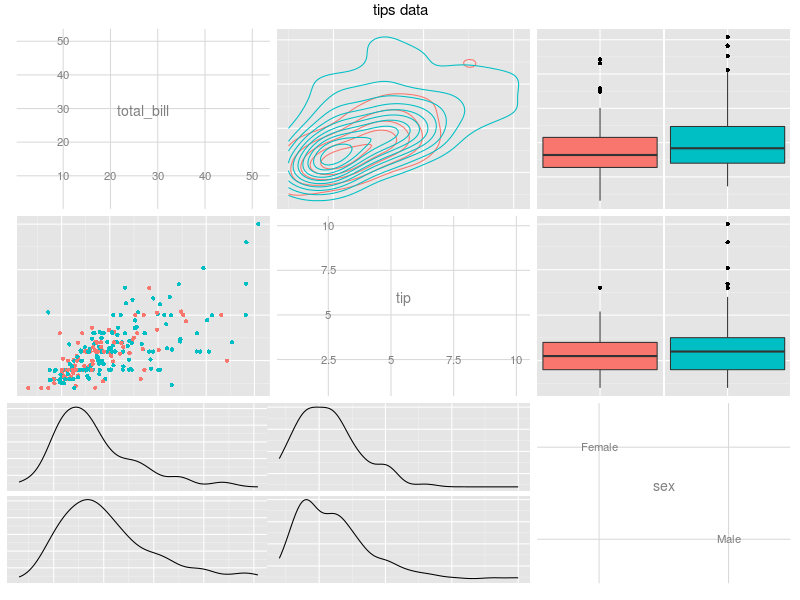 GGally is a convenient package built upon ggplot2 that contains templates for different plots to be combined into a plot matrix through the function ggpairs. It is a nice alternative to the more limited pairs function. The package has also functions to deal with parallel coordinate and network plots, none of which I have tried yet. The following code shows how easy it is to create very informative plots like the one in Figure 1.
columns=1:3, # columns to plot, default to all. Plots like the one above are very helpful, among others things, in the pre-processing stage of a classification problem, where you want to analyze your predictors given the class labels. 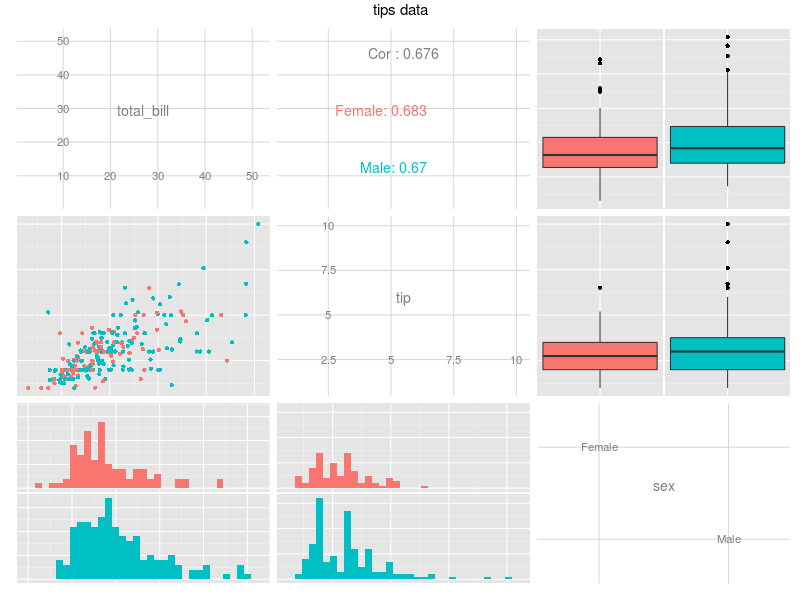 It is particularly amazing that we can now use the arguments colour, shape, size and alpha provided by ggplot2. We have some control over which type of plots to use. We can choose which type of graph will be used for continuous vs. continuous (continuous), continuous vs. discrete (combo) and discrete vs. discrete (discrete). We can also have different plots for the upper diagonal (upper) and for the lower diagonal (lower). creates Figure 2, which uses the same data used in Figure 1, but with a density plot in the upper diagonal for continuous vs. continuous variables and a density plot faceted by a discrete variable in a continuous vs. discrete scenario. discrete: exactly one of ‘facetbar’,’ratio’ or ‘blank’. We can insert a customized plot within a plot matrix created by ggpairs using the function putPlot. The following code creates a custom ggplot object cp and insert it in the second row and third column of the ggpairs object pm. GGally reference manual and help files.